Moulded from a strong high gloss acrylic, the seat design of the Stardust Brushed Steel Bar Stool Smoked works as an instantly alluring, central feature for any bar area. 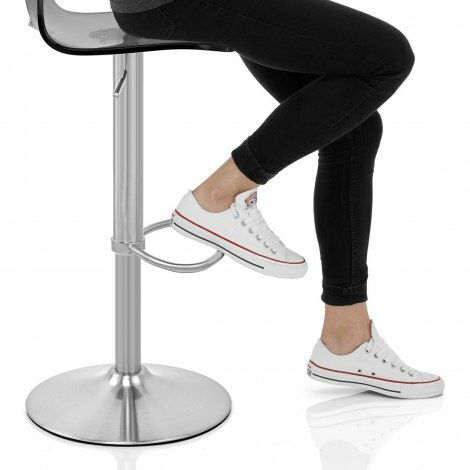 A modern model with captivating style, the Stardust Bar Stool is a first class choice. Exuding minimalism, it is translucent with a distinguishing light smoked colour, whilst the contoured shape and medium height backrest promote comfort. Its overall transparency, along with the cut-out opening on the backrest, allows for the creation of a greater amount of visual space, making it suitable for areas of varying size. The sleek brushed steel stem features a convenient gas lift mechanism that can both vary height and enable a full 360-degree rotation, along with a protective ring beneath the base to help preserve your floor surface. "Looks so good in my new kitchen going to order another"
We love our 2 new bar stools. Very comfortable and brushed still base looks good. We intend to purchase another to go with it. Very nice stylish bar stools look great very happy may purchase one more as have room. Very easy to put together. Arrived on time. Beautiful chairs easy to assemble will be ordering another soon. Modern stool which matched the style of our kitchen. Easy to assemble and appears to be robust.